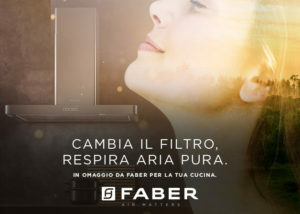 Faber has launched the “Change the filter, breathe pure air” initiative: in 8 Italian cities, consumers will have the opportunity to book – free of charge – a check-up of the Faber hood filters, including the possible change of activated carbon filters. “The kitchen is the heart of the Italian home, but also the place that requires more care and attention – explains Dino Giubbilei, Faber Marketing Director -. With this initiative we want to be promoters of a true educational path, to underline the importance of the maintenance in an appliance such as the hood, so important for the air purification of our homes. Living well the kitchen environment means doing good for the whole family”. “We want to increase the consumer’s attention towards the maintenance and care of the kitchen, and towards the importance to do a periodic check-up – adds Giubbilei -. For this reason, all those who participate in our initiative will have a useful timestrip to quickly get information on the next filter change”. The cities involved in the initiative, which will last until December 31st, are: Milan, Turin, Naples, Rome, Cimavilla (Treviso), Taglio di Po (Rovigo), Empoli and Bari. The assistance centers participating in the initiative are available at this link.